Recently removed from Frederick's starting rotation, Lucas Humpal isn't pouting or dwelling on the decision. He's just assembled his two best outings of the season. The Orioles right-hander took a perfect game into the sixth and allowed one hit with six punchouts over six innings in Class A Advanced Frederick's 8-1 win over Lynchburg in the second game of a doubleheader at Nymeo Field. The spot start followed a clean inning of relief in which Humpal fanned a pair of batters in a relief appearance against Wilmington on June 9. That proved to be an eye-opening appearance for Frederick pitching coach Blaine Beatty. "It was one of those 'Whoa, where has that been?' kind of moments," Beatty said of the one-inning outing. "When he came back today, it was kind of just the same thing. He went out there and just attacked. You could tell his demeanor was better. Just overall tremendous." Humpal (2-6) retired the first 17 batters he faced until Alexis Pantoja poked a two-out single to center field to squelch the perfect game. The 2016 ninth-rounder didn't dwell on it too long, fanning Mitch Longo on three pitches to finish off the sixth. "I saw a little bit more urgency with this outing," Beatty said. "With just being focused and I didn't see a lot of, as a pitching coach, the complacency. I saw him begin to understand that and say, 'Hey, I got to start pitching well.' "
Humpal lowered his ERA from 5.82 to 5.04 after throwing 50 of 76 pitches for strikes. He accrued eight of his 18 outs on the ground and didn't walk a batter. "He had an a really aggressive approach tonight," Beatty said. "He just went after guys. Threw strikes and worked in and out, pitched with his fastball and just got some early count outs and just did a nice job of mixing it up." 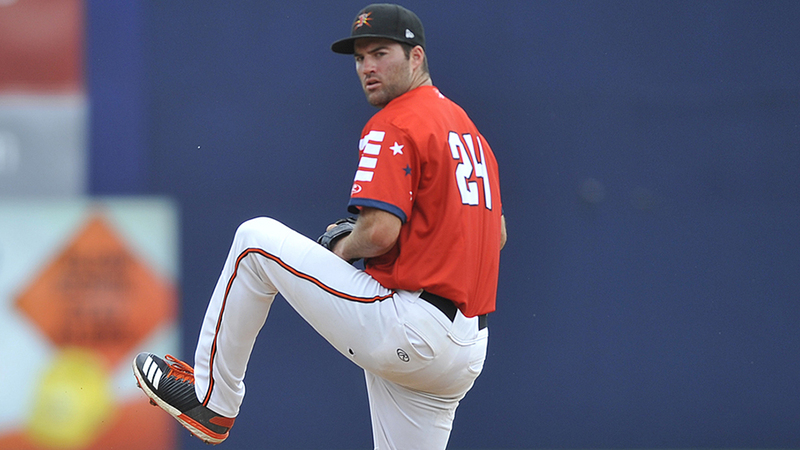 The Texas State product went 7-11 with a 4.14 ERA for Class A Delmarva in 2017 and posted a 3.34 ERA in his first professional season with Class A Short Season Aberdeen. Although he's no longer in the Keys rotation, Beatty said he's been a big asset as an innings eater for Frederick. "Although the numbers aren't good, he's really picked us up making some spot starts," Beatty explained. "He got us through some innings and stuff like that. He's really done his job well." Orioles No. 29 prospect Ryan McKenna went 2-for-2 with a solo homer and two runs scored in Game 1 and was 2-for-3 with a double and two runs scored in Game 2. T.J. Nichting went 3-for-3 with a double with two RBIs in the nightcap. The Keys won the opener of the twinbill, 2-1.